The glaucoma service is a comprehensive one including optimal medical management, tailored laser treatment and a range of surgical procedures. 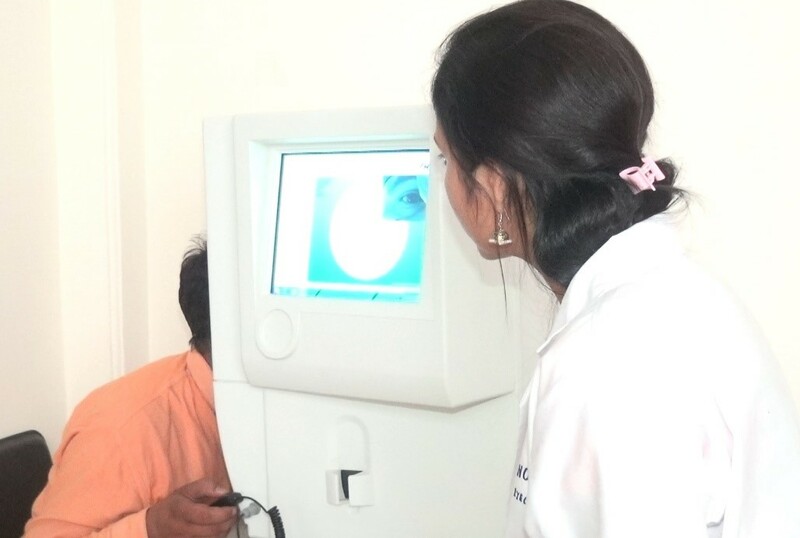 The service is manned by an experienced surgeon and with the use of latest technology such as OCT, automated perimetry and automated disc damage detection software, it is geared to manage all forms of glaucoma ranging from the common primary glaucoma to the more challenging paediatric and complicated secondary glaucoma. This service offers procedures including laser trabeculoplasty, iridotomy, filtering surgery and drainage implants. It will help ensure your compliance through a first visit to follow up facility through its advanced record management systems. Glaucoma can damage your vision so gradually you may not notice any loss of vision until the disease is at an advanced stage. The most common type of glaucoma, primary open-angle glaucoma, has no noticeable signs or symptoms except gradual vision loss. This type is less severe than the type 2 as one would be aware of it once it hits. People suffering from the type 1 glaucoma would experience pain, redness, and headache which would make you seek the help of an ophthalmologist. It can be treated with laser and usually doesn’t cause in any further complications or problems. This type is much more severe than the type 1 as one would not know that the eye is affected until an ophthalmologist diagnosis it and informs about the same. It is more severe as it runs in families and people with a family history must get a routine eye check done after an age of 30 years. Both open-angle and narrow angle glaucoma can be primary or secondary conditions. They're called primary when the cause is unknown and secondary when the condition can be traced to a known cause, such as eye injury, medications, certain eye conditions, inflammation, tumor, advanced cataract or diabetes. Primary open-angle glaucoma and Narrow angle glaucoma have completely different symptoms. In secondary glaucoma, the signs and symptoms can include those of the primary condition as well as typical glaucoma symptoms. What are the causes of glaucoma? Why does glaucoma develop? For reasons that doctors don't fully understand, increased pressure within the eye (intraocular pressure) is usually, but not always, associated with the optic nerve damage that characterizes glaucoma. This pressure is due to a buildup of a fluid (aqueous humor) that flows in and out of your eye. This fluid normally exits your eye through a drainage system at the angle where the iris and the cornea meet. When the drainage system doesn't work properly, the fluid can't filter out of the eye at its normal rate, and pressure builds within your eye. Damage to the optic nerve doesn't cause symptoms or pain, and it happens so slowly that you may lose an extensive amount of vision before you're even aware of a problem. The exact cause of primary open-angle glaucoma remains unknown. Narrow angle glaucoma, also called closed-angle glaucoma, occurs when the iris bulges forward to narrow or block the drainage angle formed by the cornea and the iris. As a result, fluid can't adequately flow through and exit your eye, and your eye pressure may increase abruptly. Angle-closure glaucoma usually occurs suddenly (acute angle-closure glaucoma), but it can also occur gradually (chronic angle-closure glaucoma). Some people with an abnormally narrow drainage angle may be at risk of developing angle-closure glaucoma. If you have a narrow drainage angle, sudden dilation of your pupils may trigger acute angle-closure glaucoma. Some infants or children may be diagnosed with glaucoma. Rarely, some children may be born with glaucoma (congenital glaucoma), develop glaucoma in the first few years of life (infantile glaucoma) or develop glaucoma after age 4 or 5 (juvenile glaucoma). Children usually won't have any symptoms. However, they have optic nerve damage, which may be caused by angle blockages or malformations (primary infantile glaucoma), or it could develop as the result of other conditions (secondary glaucoma). If your internal eye pressure (intraocular pressure) is higher than normal, you're at increased risk of developing glaucoma, though not everyone with elevated intraocular pressure develops the disease. You're at a higher risk of glaucoma if you're older. You may be at higher risk of angle-closure glaucoma if you're older than age 40. For certain groups the risk of developing glaucoma is much higher and occurs at a younger age than that of other groups. If you're 30 years and above you must have regular eye test done. If you have a family history of glaucoma, you have a greater risk of developing it. Glaucoma may have a genetic link, meaning there's a defect in one or more genes that may cause certain individuals to be more susceptible to the disease. A form of juvenile open-angle glaucoma has been clearly linked to genetic abnormalities. Severe eye injuries can cause increased eye pressure. Other eye conditions that could cause increased risk of glaucoma include eye tumors, retinal detachment, eye inflammation and lens dislocation. Certain types of eye surgery also may trigger glaucoma. Also, being nearsighted or farsighted may increase your risk of developing glaucoma. Using corticosteroid medications, especially eye-drops for a long period of time may increase your risk of developing secondary glaucoma. How is glaucoma diagnosed? What are the tests for glaucoma? Measuring intraocular pressure by the Applanation Tonometer or the non contact Tonometer. Tonometry is a simple, painless procedure that measures your internal eye pressure (intraocular pressure), after numbing your eyes with drops. It's usually the initial screening test for glaucoma. Test for optic nerve damage. To check for damage in your optic nerve, your eye doctor uses instruments to look directly through the pupil to the back of your eye. This can reveal slight changes that may indicate the beginnings of glaucoma. Your doctor will test your ability to see from a distance. To distinguish between open-angle glaucoma and narrow angle glaucoma, your eye doctor may use a technique called gonioscopy in which a special lens is placed on your eye to inspect the drainage angle. Other tests, such as imaging tests like optical coherence tomography, HRT have been developed and may sometimes be used. What is the treatment for glaucoma? How is glaucoma treated? Glaucoma treatment often starts with medicated eye-drops. Be sure to use the drops exactly as prescribed. Otherwise, your optic nerve damage could get even worse. If your doctor prescribes more than one type of eye-drop, make sure to ask how long to wait between applications and to take the drops for as long as your doctor has prescribed them. If eye-drops alone don't bring your eye pressure down to the desired level, your doctor may also prescribe an oral medication, usually in the form of a carbonic anhydrase inhibitor, to reduce your eye pressure. This medication may cause side effects including frequent urination, a tingling sensation in the fingers and toes, depression, stomach upset, and kidney stones. You may need surgery to treat glaucoma if you can't tolerate medications or if they're ineffective. Sometimes a single surgical procedure may not effectively lower your eye pressure. You may need to continue using eye-drops, or you may need another procedure. You may have an outpatient procedure called laser trabeculoplasty to treat open-angle glaucoma. After giving you a numbing eye-drop, your doctor uses a high-energy laser beam to open clogged drainage canals and help fluid drain more easily from your eye. Your doctor will need to check your eye pressure several times in the following weeks. It may take a few weeks before the full effect of the surgery becomes apparent. Laser surgery for glaucoma initially lowers pressure in your eye (intraocular pressure). Over time, however, the intraocular pressure may begin to increase. If eye-drops and laser surgery aren't effective in controlling your eye pressure, you may need a surgical procedure called a trabeculectomy. This procedure is performed in a hospital or an outpatient surgery center. You'll receive a medication to help you relax and usually an injection of anesthetic to numb your eye. Using small instruments under an operating microscope, your surgeon creates an opening in the sclera the white of your eye and removes a small piece of eye tissue at the base of your cornea through which fluid drains from your eye (the trabecular meshwork). The fluid in your eye can now freely leave the eye through this opening. As a result, your eye pressure will be lowered. Your doctor will check your eye during several follow-up visits, and you'll need to use antibiotic and anti-inflammatory eye-drops to fight infection and scarring of the newly created drainage opening. Some people with advanced glaucoma, secondary glaucoma or children with glaucoma may be eligible for drainage implants. Drainage implant surgery takes place in a hospital or an outpatient clinic. In this procedure, your eye surgeon inserts a small tube in your eye to facilitate draining fluid (aqueous humor) from your eye to reduce the pressure. Glaucoma is a preventable cause for blindness. The following will reduce the chance of developing glaucoma or damage related to it. Regular comprehensive eye exams can help detect glaucoma in its early stages before irreversible damage occurs. As a general rule, have comprehensive eye exams every three to five years after age 40 and every year after age 60. You may need more frequent screening if you have glaucoma risk factors. Glaucoma eye-drops can significantly reduce the risk that elevated eye pressure will progress to glaucoma. To be effective, these drops must be taken regularly even if you have no symptoms. While eating a healthy diet won't prevent glaucoma, it can improve your physical and mental health. It can also help you maintain a healthy weight and control your blood pressure. Serious eye injuries can lead to glaucoma. Keep your eyes protected when you use power tools or play high-speed racket sports on enclosed courts. Also wear hats and sunglasses if you spend time outside. Why consider Noble Eye Care for glaucoma management?